Check-in kiosks cut down on wait times and aid in registration.The University of Alabama at Birmingham Hospital has added 60,000 square feet of clinical space with expansion into the John N. Whitaker Building, which sits just east of the Kirklin Clinic of UAB Hospital parking deck. The new facility, called the Whitaker Clinic at UAB Hospital, will house primary care, dermatology, podiatry and rheumatology clinics. When built in 2001, the Whitaker Building housed administrative and business functions for the UAB Health System. 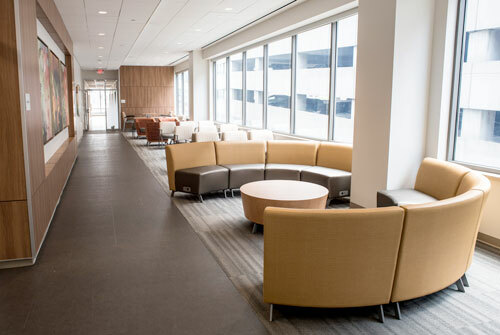 Following the move of many of those business functions to the new UAB Medicine Avondale Business Center, the second and third floors of the Whitaker building underwent a $17 million renovation to transform them into state-of-the-art clinical space. The new clinical space will feature primary care, dermatology and podiatry. Rheumatology clinics will open Sept. 11. The renovation includes 120 exam rooms, waiting areas, a full laboratory, digital X-ray, and a convenient injection area for flu shots or other basic inoculations. Valet and self-parking will be available at the Kirklin Clinic of UAB Hospital parking deck on Fifth Avenue South. A new second-floor sky bridge will connect the deck to the Whitaker Clinic. Signage and patient escorts will be available to help patients make their way to the new clinics. Valet parking and patient drop-off will also be available at the front entrance of the Whitaker Clinic, 500 22nd St. South. The design team employed a concept first utilized by ancient Roman temple architects to bring the latest thinking and best ideas in layout to the project. Called charrette, the approach features brainstorming with clinical staff and utilizes the best concepts from medical facilities around the country. 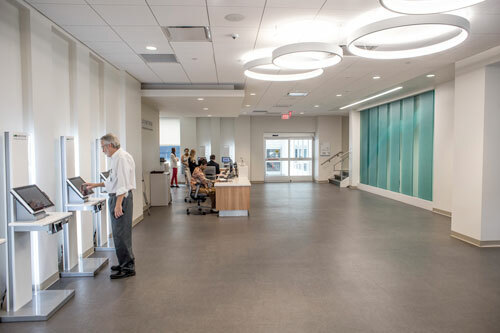 Natural light is featured throughout the Whitaker Clinic at UAB Hospital.The clinics will employ the care team model, in which all members of a physician-led care team are involved in providing patient care. The team includes a physician, physician assistant or nurse practitioner, nurses, and other medical staff who form groups of primary care staff members with collective responsibility for a set of patients. Elewski says, following the move to the Whitaker Clinic, the department will reintroduce aesthetic dermatology and laser services, which will have a suite dedicated for these services. Other features incorporated into the renovation include an additional elevator, natural light in all patient care areas, sliding doors to maximize space, and advanced technology in heating, cooling and lighting. The facility is handicap-accessible, and all furniture in the exam and waiting areas is bariatric-rated. Renovations will begin in the Kirklin Clinic of UAB Hospital later this year to reconfigure space there for additional growth. Doster Construction Company was the general contractor on the project, and Gresham, Smith and Partners was the project architect. UAB contracted with DeKalb Office for interior furnishings.